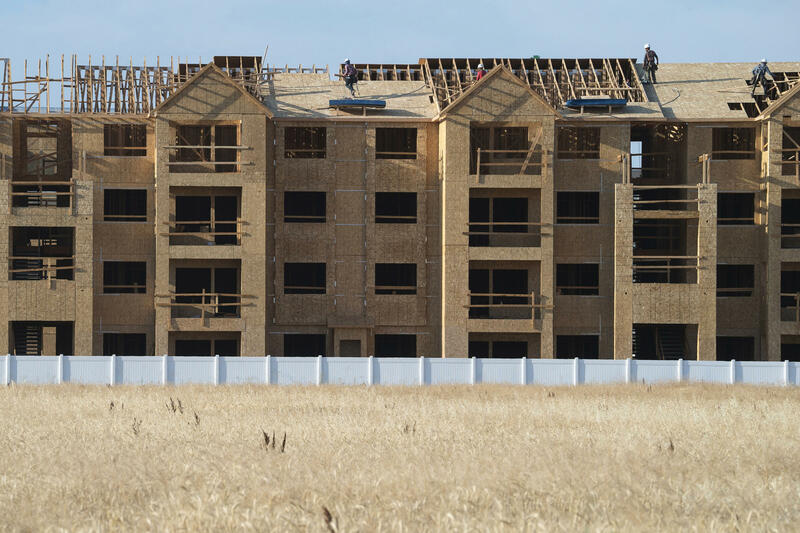 New construction rises over an empty field in Meridian, a suburb of Boise, Idaho. Today, home values have rebounded, but people who want to buy a new home are often priced out of the market. (Left) Exterior of homes at The Village at Sutherland Farm in Meridian, Idaho. (Right) Insulation installer William Matton works on a home at the complex. 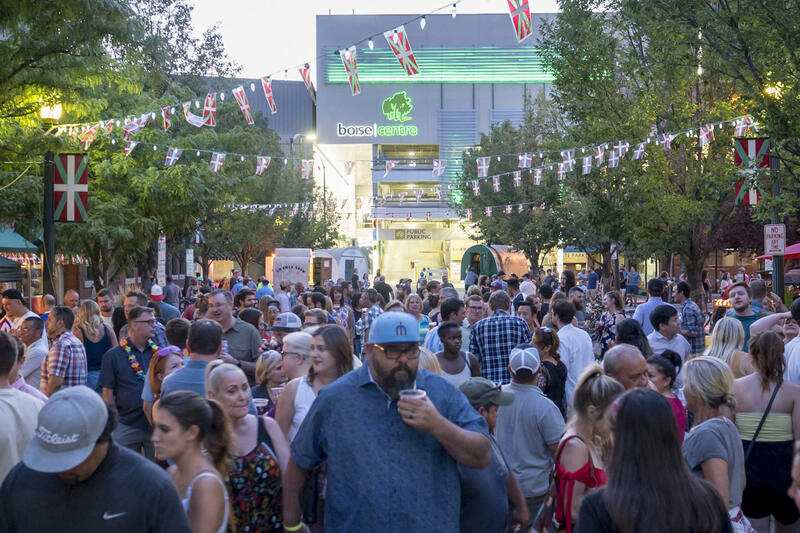 Crowds fill the Basque Block in downtown Boise during the San Inazio Festival. The festival features Basque traditions including dancing, food and music. 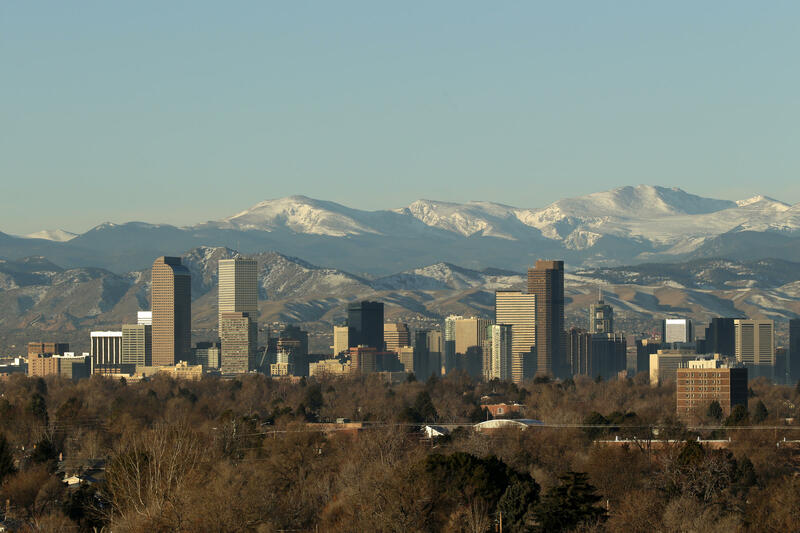 The Rocky Mountains are seen behind the Denver skyline in 2016. Bidding wars over houses have become the norm in many cities, including Denver. Joe Atalla, an architect by trade who now owns his own building firm, stands at the site of Settlers Lane in Meridian. The site will be home to 19 homes at completion. 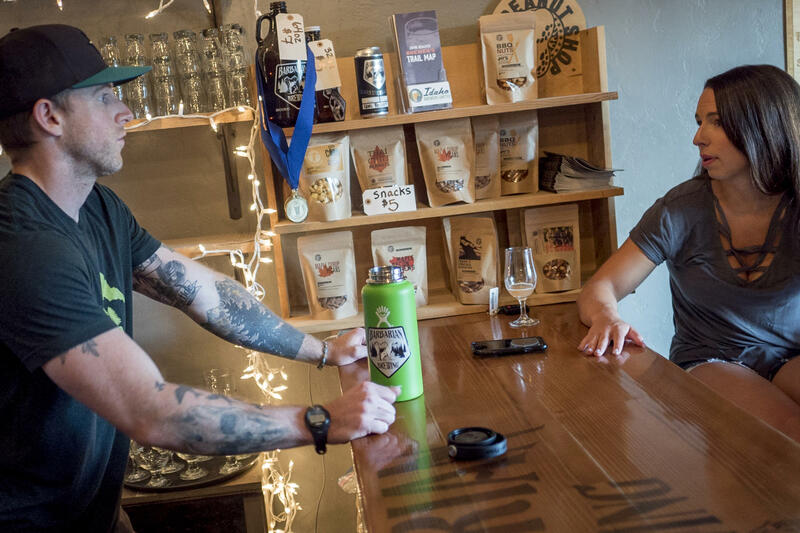 Brock Bridges, bartender at Barbarian Brewing, talks with his wife, Kayla Bridges, in the taproom. They are feeling priced out of the housing market in Boise. Home construction per household is now at its lowest levels in nearly six decades, according to researchers at the Federal Reserve Bank of Kansas City. This isn't just a problem in San Francisco or New York, where home prices and rents have gone sky-high. It is also a problem in midsize, fast-growing cities farther inland, like Des Moines, Iowa; Durham, N.C.; and Boise, Idaho. In Boise, an analysis by the U.S. Department of Housing and Urban Development showed there is a demand for more than 10 times the number of homes being built right now. We asked our audience to weigh in on their own searches for affordable homes. We heard from hundreds of people across the country who attested to hard times finding a house and prices that were rarely affordable. They wrote about being priced out of urban areas, and out of the neighborhoods in which they wanted to buy. Bidding wars were lost for homes in Michigan, Seattle and North Carolina. Student loan debt is making it impossible for a couple in New Orleans and a family in Portland to save for a down payment. Jennifer St. John has lived all her life in Boise. The city she was born in was a sleepy, tree-lined river town surrounded by farms and mountains. It's hard to recognize today. "A lot of the areas that were fields and farms are now full-on neighborhoods," said St. John, "and corners that were out in the boondocks — and why would you ever go there? — are now a booming part of town." The boom didn't really get personal for St. John until last year, when she decided she was ready to buy her first house. She's 37 and manages a learning center for kids who have autism. She's solidly middle class and can afford a house that sells for $200,000. But the median home price in Boise right now is nearly $100,000 higher than that, putting it out of reach for St. John and for the average homebuyer in Boise. "It's been hard for me," said St. John. "I'm single, there's only one income in my home and I don't want to share my house with roommates." So how did we get here, especially in cities like Boise that have long been affordable? One answer lies in the immediate aftermath of the Great Recession, when home building ground to a virtual halt. The rebound has been slow and painful. Single-family home construction is now at its lowest rate in four decades. Housing experts tick through a list of reasons for the slow pace: There's tougher zoning, there's not enough undeveloped land, lumber is expensive ... and one of the biggest problems, a labor shortage. Robert Demaray, a contractor in Boise, can attest to a lack of construction workers: "It's been real tough to find help. Thank goodness my two sons work with me," he said. With not enough workers, it's taking about two to three months longer to build homes today than it would have in 2006, before the recession. Demaray said younger people aren't going into the trades like they used to. And those workers who are here and available are hard to keep. "The guys chase dollars, you know, 'This guy over here, he'll give me a dollar more an hour so I'm gonna go,' " he said. Builders can't finish homes fast enough to keep up with demand. All of this means prices for existing homes on the market are going only one direction — up, sometimes stranding people in their current homes even if they desperately want to move. In Beaverton, Ore., Manish Gooneratne feels stuck in his home. "We bought in May 2017 when home prices in our area had reached levels compared to 2007," he said. "As of one year ago, our home is estimated to have appreciated in value by $10,000 to $12,000. This is great, but since we barely squeezed back into the market, we doubt we'd be able to get back in even if we sold with a profit." Marjie and Ben Vick in suburban Denver have been in their current house for four years. Their property has almost doubled in value since they purchased it. "We thought it was pretty incredible," said Ben. Incredible, that is, until he and his wife started looking for a new house with a bigger yard and could find nothing. Every house they looked at they were outbid or lost to cash offers. Bidding wars have become the norm in many cities. "Of the two times we've put in an offer in the past year, we've been left behind by bidding wars several thousands of dollars over asking prices, often times cash offers," says Meredith Falkenstien of Lawrence, Kan.
Marjie Vick admits to being disappointed. "We work hard for what we have and what we want and what we want our life to be," she said, "and it's just a dream that we can't attain." The real crunch in supply is for so-called starter homes — a home meant to be affordable, smaller in size — perfect for that first-time homeowner. But across the nation, builders are focusing much more of their efforts on high-end construction. In Boise, for example, 65 percent of homes for sale are on the upper end of the market. Thirty years ago, half of all homes on the market were smaller and less expensive, according to this year's State of the Nation's Housing Report from Harvard University. In 2017, that percentage had fallen to 22 percent, or less than a quarter. Joe Atalla moved with his wife to Boise 13 years ago from the San Francisco Bay Area to start a family. An architect by trade, Atalla now owns his own building firm. He explained that the lack of developable land accounts for the kinds of homes he constructs. "As a builder," he says, "if I'm building a more expensive lot, I have to build a home that justifies the cost of that lot." In its quest for more affordable housing, Boise may look to voter-approved bonds. Boise Mayor Dave Bieter admits there's a real housing crunch. "Our figures show we need to build about a thousand units a year in the city of Boise to keep the kind of demand we're seeing," he said. Boise is way behind on that goal — they've built about that much over the past five years. One large project that's underway on city-owned land not far from Bieter's office could help ease the market. But it's not going to do much in the short term. As the search for a home takes longer, home values steadily creep up. Even in suburban areas, a six-figure household income is often not enough to afford a purchase on a home. This is especially a problem in western cities, where median home prices are five times greater than incomes. That price-to-income ratio is commonly used by economists to track home affordability — the higher the ratio, the less affordable the home. The price of a typical home in the U.S. in 2017 was four times the median income. In West Coast cities like San Jose or San Francisco, the ratio was 10 times and 9 times respectively. What that translates to is that only 12 percent of residents in San Francisco can afford a home. Many potential buyers reach a breaking point where they finally resign themselves to renting long-term or moving out of the area. "We feel priced out, you know. I don't think prices are going to go down anytime soon, so it's kind of the situation where you've got to make more money or live somewhere else," said Brock Bridges, a bartender in Boise looking for a first home. Some are forced to go far outside even suburban areas to find a home. "If you were to see my home, it's damn near in the middle of a field," said Grant Bathe of Thornton, Colo. "It's telling about how far out-of-the-way you need to go to be able to find a home." Ten years after the housing market collapsed, a different crisis has emerged. Back then, a decade ago, lots of people were losing their homes. Today people who want to buy or in a lot of cases even just rent are being priced out of the market because there just aren't enough places for sale or for rent. So all this week on NPR's news shows we're taking a look at the new housing crisis in the U.S. from coastal cities to the rural heartland. And we're looking at what's being done to solve it. NPR's Kirk Siegler starts the series in one of the fastest-growing metro areas in the country - Boise, Idaho. KIRK SIEGLER, BYLINE: Jennifer St. John has lived in Idaho's Treasure Valley all her life. The Boise she was born in was a sleepy, tree-lined river town surrounded by farms and mountains. It's hard to recognize today. JENNIFER ST JOHN: A lot of the areas that were fields and farms are now full-on neighborhoods. And corners that were out in the boondocks and why would you ever go there are now a booming part of town. SIEGLER: The boom didn't really get personal, though, until last year when St. John decided she was ready to buy her first house. She's 37. She manages a learning center for autistic kids. She's solidly middle class. ST JOHN: It's been hard for me. SIEGLER: Two hundred thousand dollars is as high as she can go. She's in good company. That's the limit for the average buyer here. The problem is the median home price is a hundred grand higher than that. ST JOHN: I'm single. There's only one income in my home (laughter). And I don't want to share my house with roommates. SIEGLER: So how did we get here, especially in a city like Boise that's long marketed its livability and affordability? Well, one answer lies in the immediate aftermath of the Great Recession, when homebuilding ground to a virtual halt. And the rebound has been slow. SIEGLER: Nationwide, new home construction is lower than it's been in four decades. Housing experts tick through a list of specific reasons - there's tougher zoning; there's not enough undeveloped land; lumber is expensive. And one of the biggest problems - labor. ROBERT DEMARAY: Yeah, there is a shortage. It's been real tough to find help. Thank goodness my two sons work with me. SIEGLER: On a job site in the Boise suburb of Meridian I met Robert Demaray. SIEGLER: A huge crane is swinging each truss over to the skeleton roof where a few men are laying them in place. But because of that labor shortage, it's taking about two to three months longer to build homes than it would have back in 2006 before the recession. Demaray says after the housing crash, a lot of people in the trades left for the oil fields in North Dakota, and many didn't come back. Also, younger people aren't going into the trades like they used to, and those workers who are here and available are hard to keep. DEMARAY: The guys chase dollars. You know, they - this guy over here, he'll give me a dollar more an hour, so I'm going to go. SIEGLER: So they can't build homes fast enough to keep up with the demand. When you drive around the Boise area, it seems like every road is lined with for-sale or ready-to-build signs. You see a lot of bright flags and banners advertising brand-new spec homes, too. But a federal study showed that in Boise there is still a demand for more than 10 times the amount of homes being built right now. This is a nationwide problem, but it's especially acute in cities like Boise that are a draw for people moving from the more expensive and crowded West Coast. JOE ATALLA: This is just such a great place to live. And people do move here with a certain lifestyle in mind. SIEGLER: Joe Atalla moved with his wife 13 years ago from the Bay Area to start a family. An architect by trade, Atalla now owns his own building firm. Now, since the recession, he says developers across the country are building more high-end. If land and everything else is so expensive, you've got to make sure you're not going to go underwater. ATALLA: As a builder, if I'm buying a more expensive lot, I have to build a home that justifies the cost of that lot. SIEGLER: In Boise, two-thirds of all the new homes and rentals being built right now are on the upper end of the market. Now, Atalla took me to see his new Settlers' Village development, which he sees as one possible solution. ATALLA: Yeah, we're looking to pave our roads here in the next week or so. SIEGLER: It's an infill project, smaller homes on denser lots. Now, they'll still sell for probably $275,000 or more, which won't help a lot of people here. But Atalla says it's a start. ATALLA: I really like these smaller projects. It plays well into some of what we're trying to do where we can bring homes at a lower price point into the marketplace. SIEGLER: In some ways, Boise is a victim of its own success. Its easy access to hiking trails and trout streams and skiing always puts it high on top 10 lists by outdoor lifestyle magazines. DAVE BIETER: You know, we'll take these kinds of problems, you know? SIEGLER: Boise's popular longtime mayor Dave Bieter says a lot of cities and towns would envy being in this position. BIETER: You know, with 2.6 unemployment - you know, our unemployment's so low here it looks like a typo. SIEGLER: The only problem is, where is everybody going to live - the teachers, the firefighters, the service workers that make a city tick? BIETER: Our figures show we need to build about a thousand units a year in the city of Boise to keep, you know, the kind of demand we're seeing. SIEGLER: And they're way behind in that goal. 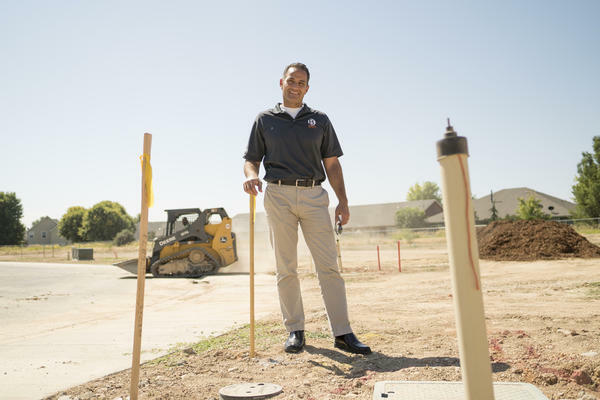 The city may look to voter-approved bonds to build more affordable housing like one large project that's underway on city-owned land not far from Bieter's office. Now, that could help ease the market, but it's not going to do too much right now. Brock Bridges is 28. He's a bartender at a local brewery. His wife is a sheriff's deputy. They've spent the past year looking for a starter home. BROCK BRIDGES: When a house that's decent pops up, it gets so many offers it's almost impossible. SIEGLER: Bridges says it's nice to have new people coming in. He's just tired of losing out on all the bidding wars for houses. One they recently bid on got 16 other offers, some all cash. BRIDGES: We feel priced out. You know, I don't think prices are going to go down anytime soon. So it's the kind of situation where you've got to make more money or live somewhere else. SIEGLER: So he and his wife are going to keep renting, which isn't exactly cheap anymore in Boise or a whole lot of other places either. That's what we'll dive into in the next story in this series later today on All Things Considered. Kirk Siegler, NPR News, Boise. (SOUNDBITE OF PRIESEMUT'S "THE BEARABLE") Transcript provided by NPR, Copyright NPR.